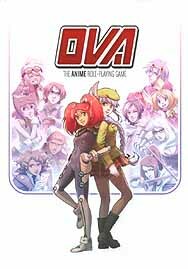 OVA: The Anime Role Playing Game lets you and your friends become your favourite characters from the diverse worlds of Japanese animation. All you need are pencils, paper, dice, and your imagination! Save the princess (or prince!) from a fire-breathing dragon, tackle invading squadrons of giant robots, or find true love amid campus hijinks. It's all up to you. With OVA, there's no need to worry about rows of numbers and statistics. Creating characters takes just minutes - it's as simple as describing them! Detailed examples and over 65 illustrations featuring OVA's colourful,recurring characters are presented throughout the book. The rules are only as complicated as you want them to be. Whether you keep it simple of fine-tune every detail, OVA is perfect for gamers old and new.